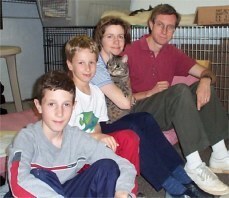 SOCRATES WAS ADOPTED JUNE 8, 2003! Here's the official update on the "Good 'n Purry" boy known as Socrates. Photos are attached. Socrates came into our home on Sunday, June 8th. We expected him to be a little shy, so we let him out in the laundry room. 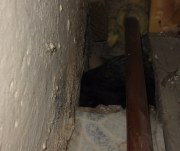 He immediately found the one weak spot in our house that we had never known about- a small crawl space between two narrow walls underneath a concrete floor and a pipe. He burrowed in there and fell asleep. Only the back half of his body was visible, as the front was under concrete. After several hours, it was clear that getting out of the spot would be very hard- maybe impossible. I called a contractor and begged him to come over (this was Sunday night), and he cut an opening in the wall. I used a spoon to dig dirt out from around the cat, the contractor pushed the pipe as far over as possible, I prayed and pulled Socrates out, in one piece! End of that hiding place! Socrates then went into the boiler room with lots of hiding spots. We visited him constantly, and he came out and then ran back to his hiding places over the next week. After a week or so, Socrates was given access to the finished basement. From there he just expanded his territory until he was king of the entire house. 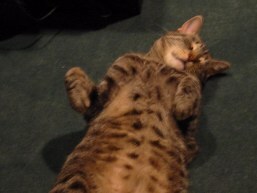 He lies on his back with his paws curled up in an upstairs study. He follows us around the house like a puppy. To anyone going through those early adjustment periods with a cat, I can truly say that amazing changes will occur if you will be patient. The waiting game is hard, but the rewards of watching the cat develop trust and confidence are worth it. In July, we adopted Sylvie from a shelter. She's a shy declawed adult, very soft and sweet. At the shelter, she was in a small cage with another cat for seven months. We kept her separated from Socrates while giving him the run of the house. She's out and about now. They are in the coexisting stage on the way to a great friendship! We can't thank you enough for your caring work with animals and especially for taking in Socrates, getting to know him and letting us adopt him! We looking forward to many years of purring and petting. 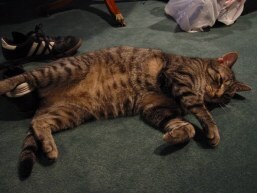 Socrates found himself in a shelter when he was turned in by a person whose rommmate had moved out and left his cats behind. Socrates is an extremely warm and friendly cat. When we reached into his cage at the shelter, he immediately came to us for attention. His movements seemed a little odd and we saw that he had slipped a front leg through his collar, resulting in the collar digging into his armpit. We took his collar off right away. The shelter staff had not noticed and it must have been like that for a while since a mark was left in his fur. That will go back to normal soon and no damage was done. Socrates got a little massage to restore his circulation and he was good as new. As soon as Socrates arrived at one of our foster homes he was placed in a crate in order to acclimate to his new surroundings. Another foster cat proceeded to jump into the crate to inspect the newcomer before we could stop her and Socrates did not mind in the least, so we know he likes other cats. Socrates is 3 years old, most definitely a lap cat, is neutered and front declawed. He was given a bath (for which he was very well behaved) and is now soft and fluffy.